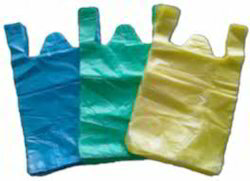 We have gained recognition as an eminent enterprise, devotedly engaged in manufacturing and supplying a broad range of HDPE Shopping Bag. Established in the year 2010 at Rajkot (Gujarat, India), we “Neo Polymers” are a Partnership firm, engaged in Manufacturing and Supplying a vast gamut of Plastic Bag, HDPE Bag, PP Bag, Kirana Bag, Liner Bag, T-Shirt Bag, LDPE Bag and LDPE Roll. Offered products are widely appreciated by our clients due to their excellent fine finish, moisture resistance, tear resistance and durability. Under the able guidance of “Mr. Jyupin Kagathara” (Partner), who has vast experience in this industry, we have carved a formidable niche in this domain.